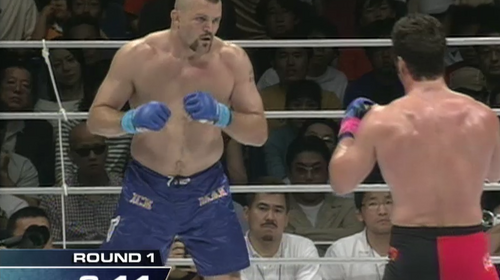 PRIDE 14: Clash of the Titans saw another talent-rich card with KO artists like Wanderlei Silva & Igor Vovchanchyn, Japanese wrestlers collided with Kazuyuki Fujita vs. Yoshihiro Takayama, and the debut of UFC star Chuck “The Iceman” Liddell. Kazuyuki Fujita vs. Yoshihiro Takayama PRIDE 14: Clash of the Titans Sun, May 27, 2001 (23:07) Scoring wins in back-to-back PRIDE bouts, Japanese amateur wrestling standout Kazuyuki “Iron Head” Fujita with his 6-1 pro record was set to scrap with famed Japanese professional wrestler Yoshihiro Takayama who was making his MMA debut. 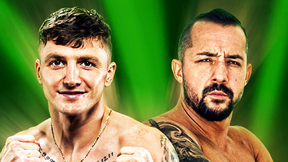 Igor Vovchanchyn vs. Gilbert Yvel PRIDE 14: Clash of the Titans Sun, May 27, 2001 (6:47) After losing only his 4th fight in his 50 fight career, prolific kickboxer turned prolific MMA knockout artist Igor “Ice Cold” Vovchanchyn jumped right back into the PRIDE for a striker’s duel with Dutch Muay Thai striker “The Hurricane” Gilbert Yvel. 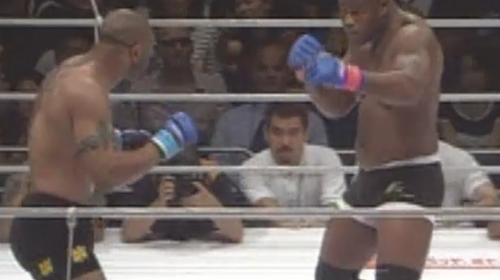 Wanderlei Silva vs. Shungo Oyama PRIDE 14: Clash of the Titans Sun, May 27, 2001 (4:24) Unbeaten in seven PRIDE appearances, Wanderlei “The Axe-Murderer” Silva with his aggressive & effective striking targeted his career 16th win against the highly-accomplished judo & sambo practitioner Shungo Oyama who was 1-1 since transitioning to MMA. Dan Henderson vs. Akira Shoji PRIDE 14: Clash of the Titans Sun, May 27, 2001 (25:39) Splitting the difference in his two PRIDE appearances, former 2x US Olympic Greco-Roman wrestler Dan Henderson who scored a first round KO to improve his record to 10-1 took to the ring to scrap with fan-favorite Akira Shoji with his 8-4-5 pro record. Vitor Belfort vs Heath Herring PRIDE 14: Clash of the Titans Sun, May 27, 2001 (31:06) Enjoying a three straight win inside the PRIDE ring, UFC 12 heavyweight tournament winner “The Phenom” Vitor Belfort, with his fast punches & slick submission skills, took on “The Texas Crazy Horse” Heath Herring, who had scored four straight stoppages in PRIDE. 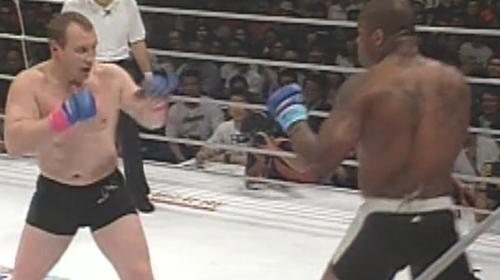 Gary Goodridge vs. Valentijn Overeem PRIDE 14: Clash of the Titans Sun, May 27, 2001 (6:28) After scoring back-to-back stoppage wins, Gary “Big Daddy” Goodridge continued his streak of winning all his bouts by finish and aimed to get his record above .500 against debuting sub specialist Valentijn Overeem who had won 8 of his last 9 bouts. 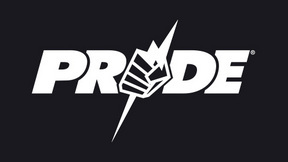 Daijiro Matsui vs. Jose Landi-Jons PRIDE 14: Clash of the Titans Sun, May 27, 2001 (30:10) Making his PRIDE debut, the enigmatic & always-entertaining Cuban-Brazilian Muay Thai striker Jose 'Pele' Landi-Jons and his 19-5 pro record with 17 wins by finish entered the ring to face catch-wrestler & pro wrestler Daijiro “The Japanese Tank” Matsui. Antonio Schembri vs. Johil De Oliveira PRIDE 14: Clash of the Titans Sun, May 27, 2001 (9:43) An all-Brazilian collision as decorated BJJ blackbelt Antonio Schembri in his pro MMA debut was ready to make his first trip into the PRIDE ring against fellow countryman & luta livre specialist Johil De Oliveira with his 11-4-1 pro record.